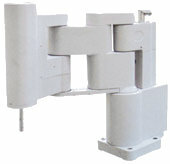 SCARA Robot Systems are specially designed for assembly applications. The characteristic design of a SCARA ("Selective Compliance Assembly Robot Arm") offers compliance in the horizontal plane and high rigidity in vertical direction which is perfectly suited for "Pick and Place Applications". Compared to the work area, the required installation space of a SCARA is relatively small. This is one of the reasons why SCARAs are used for various handling applications as well. 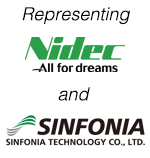 Sankyo is a World pioneer in commercialization of SCARA type robots. 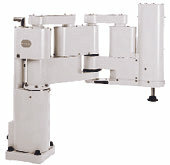 Today, a wide range of different Sankyo SCARA Robot Systems are available. In their early years, IBM offered SCARA Robot Systems as well. We are able to provide technical assistance and services for the IBM 7575 and IBM 7576 Robot Systems.